Vibrant and alluring it displays notes of dark red fruits, blackberries and dark chocolate with a deep earthy undertone held together with ripe tannins, fine acidity and minerality. 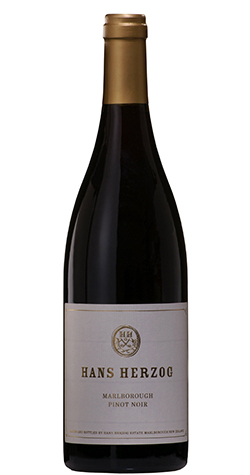 An exceptional rich ruby red wine of outstanding depth and structure. Vibrant and alluring it displays notes of dark red fruits, blackberries and dark chocolate with a deep earthy undertone held together with ripe tannins, fine acidity, and minerality. Hans wants you to enjoy his small-production and truly handmade Pinot at its full potential like you would with a “Grand Cru” Burgundy and aged the bottles a further three years before releasing without the heavy price tag! This elegant stunner will develop beautifully over many years. Our organic winemaking allows the grapes to retain the elegant rose gold colour and intense flavours extracted from the skin and carried through to the glass. The natural secondary fermentation on the lees with regular stirring provides silkiness, complexity, and depth. Unfined and only light filtration to retain the beautiful aromas. This wine is not exposed to cold stabilization and natural sediments may show. After a perfect, warm autumn we handpicked less than 900g/vine of wonderful, physiologically ripe grapes for a vibrant and alluring Pinot. The grapes were given four days to cold-soak before a natural wild yeast initiation of the ferment. The wine spent 24 days on skins before being pressed and transferred into 20% new French Allier barriques for malolactic fermentation and further aging for 18 months. Unfined & unfiltered to retain the great flavours. Natural sediments may show. Hans Herzog Estate - Hans Family Estate is one of New Zealand’s most treasured, truly artisan wineries, and Hans Herzog one of its most respected winemakers with more than 40 vintages of winegrowing under his belt.